After everything I went through, I canâ&#x20AC;&#x2122;t say enough about Network Health and Froedtert. I will be with Network Health for as long as I can. Network Health member, Ed Whealon, finds comfort in care management support. © 2018 Network Health. No portion of this newsletter may be reproduced without written permission from Network Health. new look and enhanced functionality is coming to Network Health’s website and member portal. Based on real member feedback, we’re creating a new mobile-responsive website and member portal with increased functionality focused on an improved user experience. It will be easier than ever to get benefit information, view out-of-pocket expenses and claims, reorder an ID card, access plan materials and engage in wellness programs. Watch your mailbox for information about how to register later this year. 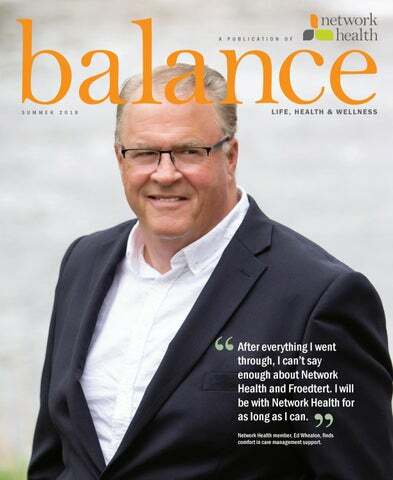 Balance is published by Network Health. The health information contained in Balance is meant to supplement, not replace, the advice of health care professionals. etting and staying healthy takes a combination of motivation and support along with tools designed to help you succeed in making lasting changes that turn into healthy habits for life. Network Health offers several different workplace wellness programs with interactive tools to help employees stay focused, rewarding them along the way for making healthy choices. There are also tools available like MDLIVE®, where members use their phone, smartphone, tablet or PC to connect with a board-certified physician for the treatment of a wide range of non-emergency conditions. Call our highly rated customer service team. EMMI, an online catalog with a variety of self-management modules made available to Network Health members, helps individuals better understand how to stay healthy or learn more about different health conditions. To see an example from the online EMMI catalog, visit goemmi.com/NETWORKHEALTHNUTRITION, enter your member ID to view the presentation. HOURS Monday, Wednesday–Friday: 8 a.m. to 5 p.m. Tuesday: 8 a.m. to 4 p.m. These tools and programs are available to most Network Health members. But there are also several apps for your mobile phone to help track your health progress and offer fitness and nutrition guidance to help you develop healthy habits and stay on track. PLANS THROUGH AN EMPLOYER 800-826-0940 PLANS FOR INDIVIDUALS AND FAMILIES 855-275-1400 STATE OF WISCONSIN EMPLOYEES/MEMBERS 844-625-2208 Monday–Thursday: 7:30 a.m. to 6 p.m. Friday: 7:30 a.m. to 5 p.m.
Yummly is a recipe app that takes cravings, diet goals and allergies and recommends healthy options tailored to the user. The app has hundreds of recipes to browse through, but will also make recommendations based on the user’s past searches. Once you have your ideal meal in mind, save the recipe and ingredients in the app’s shopping list. Check out our blog at copilotwi.com. The lengthy library of recipes available from Allrecipes is built by a community of more than 30 million users. The photos, reviews and ratings are all provided by real users testing real recipes. The app shares information about where to find current sales on certain ingredients and even recommends recipes when you walk into certain stores. This app also has a shopping list and lets users save favorite recipes and search recipes by diet, cooking time and ingredients. etwork Health evaluates new technology and new applications of existing technologies on a regular basis to ensure our members are receiving safe and effective treatment and care. This includes the evaluation of behavioral health and medical procedures, drugs and devices. Decision making on technologies is based on, but not limited to the following. It all begins with your personal doctor. Your personal doctor’s office files a claim for the service they provide you. Each service has a procedure and diagnosis code. The procedure code tells us what was done during the visit, and the diagnosis code tells us why. Have you ever wondered about the different steps to process insurance claims? Each claim has its own lifecycle, where specific measures and steps are taken to ensure accuracy. Next, your claim gets filed with us electronically or by paper. Your claim is dated when we receive it, then entered into our system. Paper claims are manually entered into our claims processing system, while electronic claims are loaded directly. To ensure accuracy, your claim then goes through auditing. Our claims processing system is set up to correspond with your benefits. This allows your claim to process without anyone manually looking at it. Claims not automatically processed are reviewed by a claims analyst. New technologies are reviewed by our Medical Policy Committee (MPC). Which is composed of a group of participating physicians and Network Health staff. This group makes recommendations for inclusions as a covered benefit. The following technology assessments have been reviewed over the past 12 months. •	3D mammography/a.k.a. breast tomosynthesis - MPC decided this technology is safe and effective. Network Health has removed this technology from our experimental, investigational and unproven review process. •	OPTUNE Device (Tumor Treatment Fields therapy - TTF) - MPC decided this technology remains experimental, investigational and unproven. •	Epifix (skin substitute material) - MPC determined this to be safe and appropriate for diabetic foot ulcers and venous stasis ulcers, when applicable criteria are met. This has been added to our Skin Substitutes Medical policy. •	Grafix (skin substitute material) - MPC determined this to be safe and appropriate for diabetic foot ulcers when applicable criteria are met. This has been added to our Skin Substitutes Medical policy. If you have a question about a technology assessment, contact our care management department at 800-236-0208 (TTY users call 800-947-3529), Monday through Friday between 8 a.m. and 5 p.m. Bilingual language assistance or translation services are available. When your claim is processed, we verify that your insurance coverage was effective on the date you received the service. Our processing system automatically checks that the service is covered, and we will check that the doctor you saw is in our network. We then review your claim against your benefits. This determines if you have out-of-pocket costs, like a deductible. If your doctor is in our network, we pass on discounts to you and you’ll owe less. Our system will then apply your deductible to your claim and notify your doctor what you owe. If you’ve already reached your deductible for the year, we pay the amount directly to the provider. You’ll get an explanation of benefits (EOB) document showing how your claim was processed. The EOB is not a bill. hroughout the year, Network Health conducts member surveys because we want to know how you feel about Network Health and your doctors. Surveys gauge our performance and your satisfaction with topics covering customer service, benefits, drug plans and access to your personal doctor and specialists. Once payment is made by your doctor, it’s posted to your account. Your doctor’s office then sends you a statement indicating any remaining amount you owe. Network Health conducts a handful of surveys, but most often, a third-party survey administrator will conduct an anonymous survey. This is a health insurance industry best practice to help ensure questions are unbiased and results are accurate. Survey results also shape decisions at Network Health. Your feedback helps define which aspects of our business are thriving and identify areas for improvement. Do you know your rights and responsibilities as a Network Health member? To learn more about how we provide you with service that respects your rights, go to networkhealth.com/legal/statements/Member_Rights.php. You can also call 800-826-0940 or 920-720-1300.
ummer is a great time to get outdoors. Whether you are spending time around the lake or pool, in the woods or just getting outside and being active, it can lead to common summer ailments such as sunburn, bug bites, dehydration and heat rash. Here is a list of some of the most common ailments and how to identify and treat them. Heatstroke and dehydration are two major causes of illness in the summertime. Heatstroke symptoms include a change in mental status, confusion, lack of sweating and the skin turns hot and red. Dehydration symptoms include increased thirst, dry mouth, weakness, dizziness, confusion, sluggishness and fainting. Go to a cooled room with air conditioning, drink plenty of water and use ice packs on the neck. Look for more hydration help on the next page. Sunburn is one of the most common summertime injuries, mostly caused by not wearing or reapplying sunscreen. Sunscreen should be applied before you go outside, reapplied at least every two hours to avoid sunburn. Make sure to choose a sunscreen with an SPF of 30 or higher, that is water resistant and provides broad-spectrum coverage, which means it protects you from UVA and UVB rays. To further reduce the risk for sunburn, avoid or minimize outdoor activities between 10 a.m. and 2 p.m., when the sun is the strongest and wear a hat, sun protective clothing and sunglasses. These measures can also reduce the risk of skin cancer. Minor sunburns can be treated with aloe and other soothing lotions, as well as pain relievers. A blistering sunburn may require treatment at an urgent care facility. Blisters could indicate a second- or third-degree sunburn and should receive medical attention to prevent infection. Many insect stings and bites, such as mosquito bites, are mostly just annoying. But in Wisconsin, these insects are known to transmit certain infectious diseases, such as West Nile disease. Although rare, individuals who have suffered mosquito bites and are displaying symptoms such as a fever, should be tested. To relieve mild pain, itching and swelling of a sting or bite, wash the area with soap and water, then apply an ice pack or cold cloth for 15 to 20 minutes once an hour for six hours. You can also use a nonprescription cream or gel with hydrocortisone or lidocaine to relieve the itching, redness and swelling. If you have trouble breathing, swelling of the lips, eyelids or throat, dizziness or nausea, seek medical attention right away. to bees, have been stung multiple times or show symptoms of anaphylaxis. In these cases, the person should be treated immediately with Benadryl and an epinephrine injection. An appointment with a doctor should also be scheduled for those who are allergic to bee stings or are showing signs of anaphylaxis. If you spend any time outdoors in Wisconsin’s wonderful nature areas, you are exposed to ticks and the risk of Lyme Disease. The disease is acquired from an infected deer tick that bites you and stays attached for at least 24 hours. Symptoms begin within a month of exposure and often start as a reddish rash around or near the site of the tick bite. The rash expands in size over a period of days or weeks. During the rash stage, other symptoms such as fever, headache, fatigue, stiff neck, muscle and/or joint pain may be present. These signs and symptoms may last for several weeks. If left untreated, complications such as meningitis, facial palsy, heart abnormalities and arthritis may occur within a few weeks to months after the initial onset of symptoms. ater covers about 70 percent of the earth and makes up about 60 percent of our bodies. But with water everywhere, we still need to make an effort to drink enough each day, especially in the summer months. How do you become dehydrated? The disease is treated with oral or injectable antibiotics and is more easily treated when detected early. Promptly see your personal doctor if signs and symptoms consistent with Lyme disease develop. Dehydration occurs when you lose more fluids than you take in. If you don’t replace lost fluids, your body can’t carry out its normal functions. Who is at the greatest risk for dehydration? Anyone can suffer from dehydration, but certain people are at greater risk. Infants and children – With a small body weight, children need to be careful not to lose too many fluids. Older adults – Your body’s ability to conserve water reduces with age. If you have an elderly family member, keep an eye on his or her fluid intake because older people tend to eat and drink less than younger people. People with chronic illnesses – You’re less likely to eat or drink when feeling sick. Endurance athletes – The longer you exercise, the harder it is to stay hydrated. During exercise, your body may lose more water than it can absorb. People exposed to hot/humid weather – It takes longer for your body to cool itself in humid weather, which leads to an increased body temperature and the need for more fluids. Seek immediate medical attention if you experience extreme thirst, a lack of urination, shriveled skin, dizziness and confusion. How do you avoid dehydration? The best way to avoid dehydration is to simply drink water. Certain foods, such as fruits and vegetables, also provide sources of water. Remember, alcoholic and caffeinated beverages, such as coffee and soda, will actually pull water from your body and promote dehydration. And, consuming caffeine-packed energy drinks before, during or after sports can also worsen dehydration. So, water is your best option. plan, presented it to the Shawano Industrial Development Commissions and got approval to buy land to build her kennel. They broke ground in spring 1997 and opened Complete Canine Care Center in the fall of that same year. “This was her dream and I wanted to support it because that is what husbands do,” Ed said. “Her plan was to double the size of facility in five years, but it only took three.” Every year the business continued to grow with Diana managing daily operations and Ed helping when he could while also working as a Shawano police officer. Life was busy and good for the Whealons until October of 2015. Diana woke up one morning itchy all over her body. She thought it was a reaction to Humira™, a drug she was taking for her rheumatoid arthritis. After a week, the itching grew worse, even on the bottom of her feet, and Ed noticed she appeared yellow. They visited her personal doctor who ordered a blood test. Results showed elevated bilirubin numbers. Higher levels of bilirubin may indicate different types of liver problems. Her doctor also ordered an MRI, which showed something on Diana’s liver. like speckles of pepper on other internal organs. While Hong and the other doctors believed they knew what it was, they tested it and it was confirmed—the cancer from Diana’s liver had spread to other areas of her body. From previous phone calls with Rosanne, Ed knew this was not good. Once cancer spreads, doctors will not put a healthy organ inside a patient in this condition. He would deliver the news to Diana. Diana was referred to Appleton Medical Center for a biopsy. When the doctor came in the room, he had some unexpected news. He believed Diana had cholangiocarcinoma, a rare and often fatal cancer that effects the liver’s bile ducts. The doctor also believed the mass on her liver was a tumor blocking the bile ducts, causing a backup and the yellowish color in Diana’s skin. The only chance of survival was a liver transplant. In her room, Ed looked at his sleeping wife and dreaded having to tell her she didn’t get her transplant. When Diana woke up, she looked at Ed and asked if she had gotten the liver. “We were stunned, to get that type of news just rocked our world.” Ed said. They spent a day digesting the news and had what Ed called a “oneday pity party.” After that, it was time to move into action. Diana and Ed traveled to Froedtert Medical Center, in Milwaukee, where doctors confirmed cholangiocarcinoma and put a stent in to relieve the blockage. The doctors also provided a very honest assessment of the situation. After the disappointing news, they were still determined to explore all opportunities to help her. “We explored clinical trials or any treatment to give her just a little more time,” Ed said. They soon realized there weren’t many options for Diana based on the amount of chemotherapy she had undergone over the previous two years. Throughout Diana’s illness, they had stayed in Cedarburg with Diana’s parents to be closer to Milwaukee in case they got a transplant call from Froedtert. Cedarburg was Diana’s childhood home and she was comfortable there. She not only had her parents but her brother and sisters nearby. While Diana spent time with family, Ed would visit Shawano periodically to take care of any issues with the business or at home. “The doctors told us ‘If you do nothing, two months tops. If you follow the program for a transplant, it could be two years or more and we believe we could have a liver by then,’” Ed recalled. We were stunned, to get that type of news just rocked our world. The Whealons called Network Health to learn about next steps. They got a call back from Network Health Care Management Coordinator, Rosanne Rott, RN. Ed’s wife, Diana Whealon, passed away in December 2017. had retired from the police department and my focus was on whatever I needed to do to help Diana.” Over the next two years, Diana focused on staying positive and following her doctors’ guidance. She also became an advocate for organ donation. She believed if one person became a donor because of hearing her story, it was worth it. Rosanne checked in regularly with Diana to see how they were doing, which meant a lot to both Diana and Ed. “Rosanne became an ally for Diana,” Ed said. “Diana felt comfortable right off the bat with Rosanne and she needed that, given the situation.” Rosanne also provided support to Ed who, as the primary care giver, needed someone to understand the challenges and stress he was feeling. In the summer of 2017, the chemotherapy was starting to take a toll on Diana who was having challenges with her mobility. Her MELD score was also going up. In August 2017, her MELD score was 33. After everything I went through, I can’t say enough about Network Health and Froedtert. Weeks after Diana passed away, the explanation of benefits (EOB) and bills for Diana’s care began arriving, including a bill for genetic testing completed by a non-participating Network Health provider. For a non-participating provider, Network Health needed a prior authorization ahead of the test. Without prior authorization Ed was responsible for the full amount. With his wife’s death still raw and painful in his mind, he was frustrated. Between Diana not receiving her liver transplant and Ed doing whatever he could to help his wife, pre-authorization was not the first thing on his mind. He didn’t even know about the test, let alone whether it was conducted by a participating Network Health provider. S AY W H AT ? is a substance made during the normal breakdown of red blood cells. Bilirubin passes through the liver and is eventually excreted out of the body. Higher levels of bilirubin may indicate different types of liver problems. ne of the biggest health challenges men face is their reluctance to seek care. Studies suggest men are 24 percent less likely to visit a doctor than women and only 40 percent go to the doctor when they fear they have a serious medical condition. The rate of heart disease and chronic liver disease is greater among men and the most commonly diagnosed cancers include prostate, lung and colorectal. The good news is that many of these potential health risks can be prevented or treated with early detection. The following are things you can do to keep your health in check. •	Stay a step ahead of conditions that put your health at risk by seeing your personal doctor for regular checkups even if you feel fine. •	Some conditions don’t have symptoms early. By seeing your doctor for screenings and immunizations, you can seek early treatment and save on medical costs. • Many screenings and immunizations are preventive and therefore covered at no cost. For coverage information, call our customer service department at 800-826-0940.
o help you live the healthiest life possible, certain preventive services are offered at no extra cost for most Network Health members. Preventive services help you identify diseases or medical problems before you show symptoms. These services include screenings, immunizations, lab tests and other services that help you prevent health problems. When you see an in-network doctor for one of the preventive services listed in our Preventive Services Guide, most plans cover preventive services at 100 percent. However, you may be responsible for certain payments (deductible, coinsurance and copayment) if you receive the services for diagnostic reasons. If you are part of a self-insured plan, refer to your Summary Plan Description for coverage details. • Eating more fresh vegetables, fruit and lean proteins and getting in regular physical activity can help lower your blood pressure, blood sugar, cholesterol and weight. By keeping these numbers at a healthy level, you significantly reduce your chances of developing serious health problems like heart disease and type 2 diabetes. Any follow-up tests, tests to monitor a chronic disease and any tests not listed in this guide are considered diagnostic. Our Preventive Services Guide will help you understand when certain common services are considered preventive or diagnostic. • High levels of stress can cause anxiety, fatigue and depression. Stress can also lead to unhealthy habits like smoking, drinking or overeating. Find out what’s causing your stress and try to avoid the triggers. Eating healthy, sleeping well and physical activity are also great ways to reduce stress. To view our Preventive Services Guide, visit networkhealth.com/members. Select the Resources button on the right side of the screen, click Learn More then choose Preventive Services Guidelines. How do we determine which services are considered preventive? • The benefits of quitting smoking include lowering your risk of diabetes, heart and lung conditions and leads to overall better health. In fact, after only 12 hours of not smoking, the carbon monoxide level in your blood drops back to normal. Within a month, your lungs will start to function like normal and coughing and shortness of breath will significantly decrease. Quit today and get back years of your life. Our recommendations for preventive care are based on medical research from nationwide organizations like the U.S. Preventive Services Task Force. These guidelines can change from year to year depending on new research. If you have any questions about Network Health’s preventive services, call our customer service department at 800-826-0940.
pioid abuse is a growing problem in Wisconsin. Opioids are narcotic medications used to treat moderate to severe pain. You might think this is just an issue for drug users and abusers. The fact is any of us could fall victim to a dependency on opioids. Are any of the following medications in your home? If you have been prescribed opioids, use them only until pain is manageable with non-narcotic pain relievers. Keep opioid medications locked up and dispose of unused medications when they are no longer needed. Resist the urge to save them “just in case.” Dispose of the drugs properly. Flushing drugs or washing them down the drain can contaminate our water supply. Check the medication label for disposal instructions or look for drug take-back programs in your area. These prescription painkillers are some of the most commonly used opioids. Benzodiazepines, sometimes called “benzos”, are a common group of medications that work on your body’s central nervous system to treat conditions such as anxiety and trouble falling asleep. Taking benzos with opioid pain medications or alcohol can cause many negative outcomes. Opioids, benzodiazepines and alcohol can all slow down or stop signals from your brain to your body. When these signals are stopped, you may experience drowsiness, slurred speech and trouble breathing. It is important to only take your pain and anxiety medications exactly as prescribed by your doctor and to avoid alcohol. Taking more medication than necessary can be very dangerous and potentially lead to serious side effects and even death. Pharmacy Team Focused on Service and Support Network Health’s team of pharmacists and benefit specialists is here to help with your pharmacy needs. The team helps resolve member needs such as claims resolution, prior authorization assistance, provider directory assistance and formulary questions. Our pharmacists provide an extra set of “clinical eyes” to help optimize member care. They will conduct medication reviews, work directly with providers on drug appeals and partner with our health management team. Together, the pharmacy team actively manages the pharmacy benefit designs and formularies to bring costeffective therapies to members. If you are interested in a medication review with a pharmacist, or have medication-related questions, call the clinical pharmacist phone line at 920-720-1287 or 888-665-1246, 8 a.m. to 5 p.m., Monday-Friday and speak to a Network Health pharmacist. id you know Network Health has a process of evaluating providers for them to become part of our network? The process is called credentialing and takes place following the review of an individual practitioner or organization’s qualifications. Our fulltime staff performs a thorough evaluation of providers based on the following. You don’t plan on getting injured while on a trip, but because vacations sometimes turn into unexpected adventures, Network Health has you covered when you’re away from home. If you have a medical emergency when you’re out of the Network Health service area, call 911 or get to the nearest emergency room. You have health care benefits for emergency situations such as heart attacks, excessive bleeding, head traumas, broken bones or seizures. When out of the network area, your coverage allows for an emergency hospitalization until you can be moved to a participating Network Health facility. Remember to show your Network Health member ID card when being seen for care. Notify Network Health within one business day of admission for inpatient treatment at an out-of-network hospital. Providers must re-apply for credentialing with Network Health every three years with monitoring between credentialing cycles. Ongoing monitoring consists of the following. any of us experience the need for some type of health care in our life whether it’s access to after-hour care, urgent care, routine or preventive care. Network Health’s Quality Health Integration department works with doctors and hospitals to ensure you’re able to get medical care in a timely manner. You should always be able to get the care you need, so we require our providers to offer access to medical and behavioral health services without excessive scheduling delays. We communicate standards for timeliness of appointments and office waits with our provider network. If you cannot travel safely to get care from your primary care practitioner, your health care benefits allow for urgent care. This type of situation might include a minor injury, stitches, possible strep throat or an ear infection. If you are outside Network Health’s service area and you need to see a doctor, but it isn’t an emergency, you can still visit a hospital or an urgent care center located inside a hospital. Notify Network Health within one business day of admission for inpatient treatment at an out-of-network facility. Your personal doctor or other in-network providers must provide your follow-up care after an emergency or urgent care visit. If this is not possible, and you visit a doctor or hospital not in our network, you’ll need to ask for approval within 24 hours of treatment. Some out-of-area medical facilities not in Network Health’s service area may require you to pay for your care when it is provided. To get reimbursed, send itemized bills and proof of payment within 90 days of receiving care. 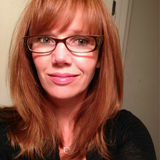 Send this information to Network Health, Attn: Claims at 1570 Midway Pl., Menasha, WI 54952. No matter where you seek care, it’s important to get all your information from your visit and share with your personal doctor. Another urgent care option is MDLIVE, a virtual visit benefit available from Network Health. This service lets you use your phone, smartphone, tablet or PC to connect with a board-certified physician or pediatrician for the treatment of a wide range of non-emergency conditions. MDLIVE is available 24 hours a day, seven days a week and, depending on your plan, you may have no copayment or be responsible for a small portion of the total cost. To activate your account, have your Network Health member number (on your Network Health ID card) and do one of the following. Approaching 65? We’ve got you covered. Use this checklist as your guide to navigating Medicare. SIX MONTHS before you turn 65 – Read up on Medicare benefits—what’s covered, what Medicare pays and what you’re expected to pay. If you plan to enroll in Medicare during your Initial Enrollment Period, set a reminder for yourself for three months before you turn 65. Check with your benefits administrator regarding enrollment into Medicare and your employer-sponsored health plan. FOUR MONTHS before you turn 65 – Start thinking about the features and benefits that will be important to you. Learn about the Medicare Advantage products available. I take prescription medications. If you do, you’ll need a plan that includes drug coverage. The plan has a fitness benefit. The plan has a dental benefit. TWO MONTHS before you turn 65 – Enroll in Medicare if you haven’t already. Sign up for a Medicare Advantage plan, so benefits __ are ready and waiting for you when you turn 65. Confirm receipt of your Medicare card. orporate social responsibility aligns with the values of Network Health, and Network Health employees are encouraged to get involved with organizations that serve the communities where we work and live. Employees are offered paid volunteer time each calendar year to benefit a charity or non-profit organization. So far in 2018, our employees have been busy. Employees participated in the Help for the Homeless drive, an event focused on collecting hygiene and cleaning items such as diapers, soap, shampoo, conditioner, toothbrushes, toothpaste, feminine care and more. On Valentine’s day, employees attended a pancake breakfast to help raise funds for St. Joseph’s Food Pantry. Senior leadership donated their time and supplies to prepare pancakes, sausages, fruit and more. Nearly $1,000 was raised and donated to St. Joseph’s. As good as Medicare is, it will not cover all of your health care expenses. Medicare also has deductibles and copayments—the parts you have to pay—and these generally go up each January. That’s why most people with Medicare choose to get their benefits through private health insurance which helps protect against those costs. These private plans may also pay for services that Medicare doesn’t. Out in the community teams donated their time to a variety of causes. Our marketing department spent an afternoon sorting and repacking nearly two full pallets of diapers for local families as part of the Fox Valley Diaper Bank. Network Health’s employee experience department spent the day putting together 1,200 Asian Noodle Stir-fry CHAMP Meals. The CHAMP program provides education and services that will meet the nutrition and health needs of all clientele at the St. Joseph Food Program. he new Network Health member portal was designed based on real user testing and feedback to provide an improved member experience. In it, you’ll find content that is unique to you. You’ll also find tools, tips and important information to help get the most out of your benefits. Plus, the new portal will be mobile responsive, so you can access your plan information 24/7 from any device. Watch for an announcement in the mail in August explaining when and how you can register.